Zhao Xue is a well rounded top female chess Grandmaster, excelling in both team matches as well as individual tournaments. Her victory in a U-20 World Girls tournament ahead of Humpy Koneru helped to launch her into the spotlight. Next she crushed the Women’s Chess Olympiad selection and normal tournaments in 2002, extremely good scores in both of them. She has also played in two Women World Championship tournaments too. Now that she is 5th best female player in the world, everyone is looking forward to her continued improvement. 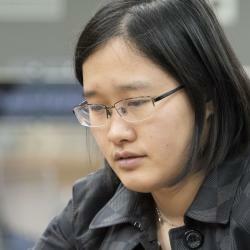 Zhao Xue learned to play chess when she was little and became a Woman Grandmaster in 2001. She also quickly became a veteran of the youth girls tournament circuit. Her biggest success in this type of tournaments was when she won the U-20 World Junior Girls Chess Championship ahead of Humpy Koneru in 2002. After this championship, Zhao won the national women’s Olympiad selection trial by a large margin, then showed that her selection was correct by scoring 11/12 on board 4 in the 2002 Women’s Chess Olympiad and winning 3 gold medals: team gold, board 4 individual gold and gold for the best rating performance. In future Olympiad tournaments she had a lot of success as well. She became an official Grandmaster in 2008. She has played in two Women’s World Championships, in 2008 and 2010, both times falling short of the finals. Recently she has ascended to become the fifth best rated female in the world and is sure to keep improving her game.